This is a study of how poets treat the theme of killing and various other depravities and immoralities in Renaissance poetry. The book explores the self-consciousness of the poet that accompanies literary killing, and explores fundamental moments in particular writings in which Renaissance poets admit themselves accountable and to a degree guilty of a process whereby the literary subject is brought to some kind of destruction. 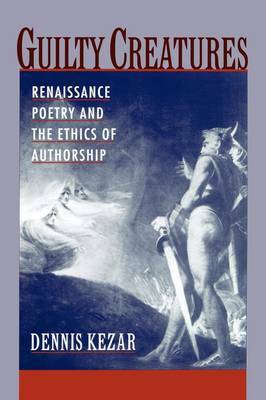 Included among the many poems Kezar uses to explore the concept of authorial guilt raised by violent representations are Skelton's Phyllyp Sparowe, Spenser's Faerie Queene, Shakespeare's Julius Caesar, and Milton's Samson Agonistes.